The wonders of a winter woodland abound around our home, situated on three wooded acres near the end of a dirt road. 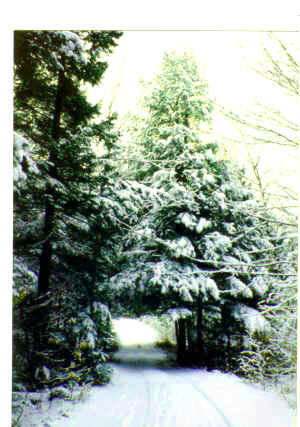 The other morning when we woke up to a few inches of snow, the evergreens were bent low with a white coating, the chickadees were uttering their distinctive call as they peered from the gourd bird house in the maple tree, blue jays called out from another area, and animal tracks criss-crossed the white ground. Even though we still don’t have much snow on the ground for this time of year, the magic of winter whiteness abounds and the grandchildren called with glee, “We had snow in the night.” Later in the day, they frolicked with their dog around the house. I’ve always been fascinated by a winter woodland and have enjoyed living in one ever since we built this home, 27 years ago. After a snow storm, the woodland is shrouded by a silence that makes each snap and crack of frosty branch, each bird call or animal’s movement seem magnified. When I was growing up on a farm, I’d walk along the trail to the woods behind our barn. Usually there was a trail to follow where Father had taken the tractor and wagon to get a load of wood for the kitchen stove and wood furnace. It was relaxing and refreshing to hike there and become aware of all the woodland sights and sounds. You can discover a winter wonderland close to home or throughout your travels in northern country where it snows. Perhaps you’re on snowshoes or cross-country skis. As you enjoy these activities while on a winter trip, take time to notice the wonderland around you. In the woodland, if you’re observant, you’ll encounter reminders of life other than human and often can read stories in the snow. For frequently, crossing your path or running beside it, you’ll see the tracks of forest and field animals and birds. The other morning, as I walked back our long driveway from the mail box, I noticed small tracks running in the snow beside the tire tracks. It wasn’t our dog, because these were much smaller. They didn’t appear to be the tracks of the neighbor’s cat. Some small creature had visited. Identifying these creatures and listening for their calls as you wend your way through little traveled areas, or even the woods around our home, can be a delightful bonus for an outdoor adventurer. Books on nature and wildlife often give a chart for deciphering the various wildlife tracks. If you’re interested in wildlife photography, reading the tracks in the snow may lead you to an exciting photo of winter wildlife wherever you travel throughout the country. Also, photographing tracks in the snow is a way to preserve your observations as a souvenir of this experience on your cross-country trek. Photographing tracks is not easy because of varying light conditions. 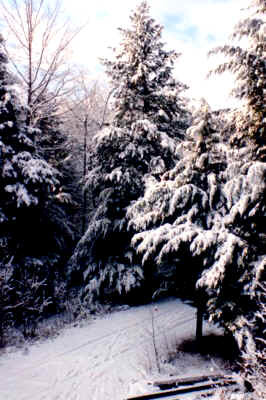 However, it is a challenge you might want to undertake on your travels through the winter woods on skis or snowshoes. This also is an enjoyable activity to undertake with youngsters. Whether you’re skiing or trekking in Waterville Valley, NH, Jackson Hole, WY, Stowe, VT, Park City, UT, Squaw Valley, CA, Steamboat Springs, CO or numerous other well-known and out-of-the- way places, there are many stories to discover and mysteries to solve through the tracks in the snow.